The BCECE 2019 will be not conducted by the Bihar Board. Admission will be done through JEE Main and NEET. The entrance examination was previously conducted for admission to various undergraduate courses like engineering, pharmacy, agriculture and many other fields offered by the various institutions of Bihar. 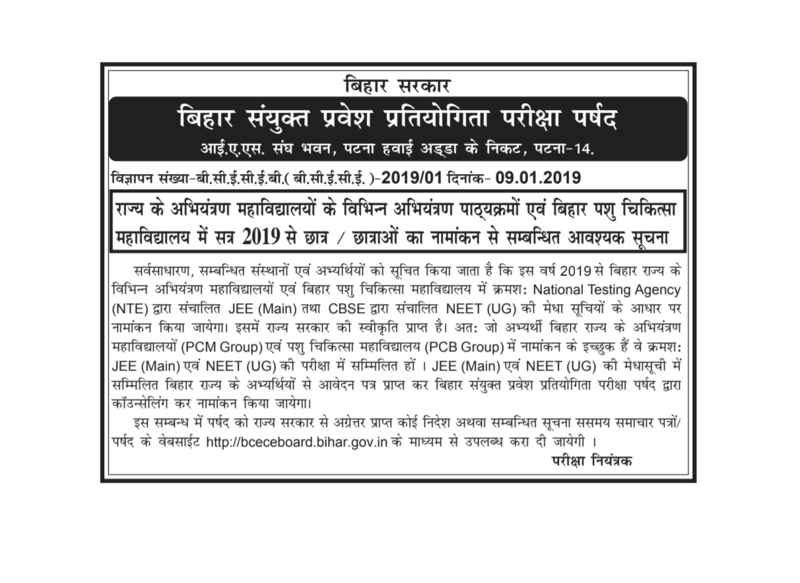 But now candidates of PCM group have to take the JEE Main 2019 and candidates of PCB group have to take the NEET 2019. Details about BCECE dates, eligibility criteria, application form and admit card have been given here. The admission to affiliated colleges of Bihar Board will not be done by BCECE 2019 but through JEE Main 2019 and NEET 2019. Read the notice given below! BCECE stands for Bihar Combined Entrance Competitive Examination. It is a state level entrance exam conducted in offline mode every year. If you want to appear for this exam, then you will be required to fill up the application form after checking the eligibility criteria. Candidates must read all the information properly to avoid rejection. Appearing candidates must check the BCECE 2019 dates given below and mark them on their calendar with the respective event for the same. Before filling out the BCECE 2019 application form, you must make sure to check if you fulfil all the eligibility criteria laid down by the exam conducting Body. The eligibility criteria will be based on various criterion like age, qualification, etc. You should have passed 10+2 qualifying examination or equivalent. Candidates must have obtained a minimum 45% marks (for general category) and 40% marks (for reserved category) in the qualifying examination. Students who are appearing for their qualifying examination in the year 2019 are also eligible to apply. Candidate must have studied Physics and Mathematics as compulsory subject with Chemistry/Biology/Biotechnology/ Technical Vocational subjects as optional. There is no age restriction to take the exam. Eligible candidates can apply for the exam through the BCECE 2019 Application form. The Application form will be available in the online mode on the official website in the 1st week of March 2019. Candidates will be required to fill up the form and also send a hard copy of the same to the address given. Candidates must make sure that they provide only the correct application details. Applicants have to fill in their personal, education details and then upload the scanned images of Photograph and signature. Applications that have been submitted with incorrect details will be liable for rejection. Applicants of BCECE Exam 2019 have to pay and the application fee will vary depending on the category of the candidate. The preparation of BCECE Exam 2019 includes checking the exam pattern of the exam first. The exam pattern contains all the information about examination like duration of the examination, number of questions, marking scheme, etc. Check the official exam pattern of BCECE 2019 stage 1 here. The exam will be conducted in the offline mode in OMR sheets. Stage 1 will be conducted for 135 minutes. The question paper will be in both English and Hindi. There will be objective type of questions from Physics, Chemistry and Mathematics/biology. The Exam will have a total of 150 questions, 50 from each section. 4 marks will be awarded for each correct answer and -1 will be given for an incorrect response. Stage 2 exam will be held for 90 minutes. The exam will be conducted offline in pen and paper-based mode. Questions will be of an Objective type like multiple type questions. There will be 100 questions in each section and there will be total 300 questions. Candidates must make sure to check the BCECE 2019 syllabus which will be released along with the official brochure. The syllabus will be from Physics, Chemistry and Mathematics or Biology. The syllabus will contain topics that the candidate has studied in class 11th and 12th. Both question papers of stage 1 and stage 2 will be from Physics, chemistry, biology, mathematics. The BCECE 2019 admit card will be made available on the official website bceceboard.gov.in. The admit card is one of the most important document that the candidate must carry to the exam centre on the day of the exam. The BCECE admit card will be released in the 2nd week of April 2019. It will carry all important information about the candidate like name, exam roll number, photograph, signature and about the exam like name and address of exam venue, exam date and time, etc. You must keep your exam roll number ready to view you admit card. Without the admit card, no candidate will be allowed to take the entrance examination. Do you know the BCECE 2019 exam centres? Well, here is a list of BCECE expected exam centres for 2019 exam that the candidates must choose during Application form filling and will be printed on the admit card of the candidate. The Bihar Board will publish the BCECE 2019 Answer Key. The answer key will be published online on the official website which is bceceboard.bihar.gov.in. Candidates will be able to view the answer key in the online mode after the exam has been conducted. The Answer key will be released in the month of May 2019. It will be available in the form of a pdf and candidates will be able to download it from here. The BCECE 2019 result of all the candidates who have taken the BCECE 2019 examination will be able to view the results in the 2nd week of June 2019. Candidates must visit the official website or can check the result link here as well. The result will reflect the performance of the candidate in the entrance examination. 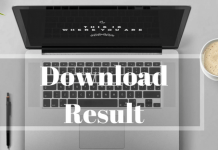 Candidates can download their result that will be available in the form of a scorecard. The scorecard will contain the name of the candidate, roll number, date of birth, qualifying status and marks scored by the candidate. Every candidate must make sure to take a print out of the result. Eligible and qualified candidates will be able to participate in the BCECE 2019 counselling. Candidates who have qualified the BCECE Exam 2019 will be required to register themselves. Candidates will be required to enter their college and course preference combination. Seat allotment of each candidate will be based on the merit list released by Bihar Board, the number of seats available and the choices filled in by the candidate. All the candidates who are participating in the BCECE counselling 2019 will be required to appear for the counselling with the required documents.